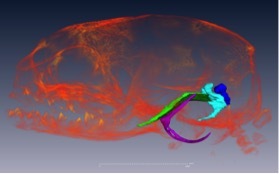 The only way to truly understand how this occurs would be to study the changes in living organisms...but are there any mammals whose development traces the full jaw-to-ear transition? Turns out there are—marsupials. The word marsupial often conjures images of pouched kangaroos hopping through the outback of Australia. Indeed, many marsupials are indigenous to Australia, but South America is home to approximately 100 species of opossums. One of these is the gray short-tailed opossum (Monodelphis domestica), a much smaller relative to the lone North American marsupial, the Virginia opossum (Didelphis virginiana). 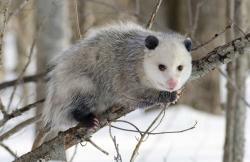 A Virginia opossum (Cody Pope via Wikimedia Commons) So how is this tiny marsupial the answer to our conundrum? Well, their small size and docile nature make them relatively easy to keep and breed in captivity. This is handy for research purposes. Additionally, it's the first marsupial to have its genome fully sequenced, so they are a good source of genetic information. Far more important—as far as I’m concerned—is the timing of their development. Marsupials are born incredibly prematurely by comparison to placental mammals. Monodelphis pups are born a mere fourteen days after conception. At this early stage, their bodies are not yet miniature versions of adults, and they must continue to develop outside of the womb. Monodelphis are actually born so prematurely, that at the time of birth, they still possess a reptilian jaw joint! This means the entire transition of jaw elements into the middle ear takes place after birth, making it possible to witness 200 million years of evolution in the first month of the marsupial’s life. This provides a unique opportunity to study the evolutionary development of mammalian middle ear bones in a living organism. Naturally, organisms could not have simply switched from one type of jaw joint to something completely different without some form of intermediate, Micro-CT scan of Monodelphis twenty days after birth. The middle ear bones (blue and dark blue) are still attached to the jaw via cartilage (green). (Image from author’s research) and they certainly did not do so. The original joint could not change location and function until the new joint was already in place. This implies there must have been a group of organisms with two functional jaw joints acting simultaneously. In fact, there is now fossil evidence showing this exact condition, organisms such as Diarthrognathus, which literally means, “two jaw joints.” Does Monodelphis have a “double jaw joint” phase? Indeed! Its jaw joint forms about fifteen days after birth, but by using improved visualization techniques such as micro-CT scans, we know that the middle ear elements do not fully disconnect from the jaw until postnatal day twenty. While there is no way to glean information about cellular or genetic changes from fossils, we can use extant organisms as proxies. Since Monodelphis undergos the same transition observed in the fossil record, we can infer the same cellular and genetic changes that they exhibit may have also been responsible for the rearrangements in ancestral organisms. By slicing frozen sections from the middle ear of Monodelphis and looking for different molecular markers, we have documented how a process called apoptosis, a form of programmed cell death, works to free the ear bones from jaw cartilage. Our lab has gone even further, using precision lasers to remove tissue samples at the exact point where the cartilage breakdown begins. We then sequence the RNA to identify differential gene expression (up-regulation or down-regulation of certain genes) before, during, and after separation from the jaw. Author with an adult Monodelphis. (photo by Anna Dowling, with permission) Using these modern techniques, we are able to characterize the transition of middle ear bones during Monodelphis development and compare it to what is seen at different stages in the fossil record. This is an exciting way to use a living organism to make testable predictions and inferences about how evolutionary changes have occurred. Furthermore, it links humans to ancestral organisms, providing evidence of our evolutionary descent from a common ancestor. Large-scale changes don’t have to be unfathomable. As we are currently finding in this instance, a small change to the genes regulating development of jaw bones could have led to a big change in the way we hear the world around us. 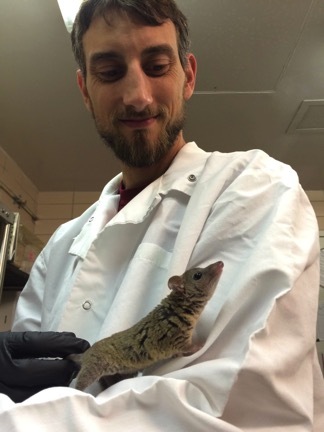 About the author: Daniel Urban is a PhD student in the Department of Animal Biology at the University of Illinois at Urbana-Champaign. He studies development and embryology of modern mammals to better understand the changes observed in the fossil record. Stephanie Keep met Dan at ComSciCon and can tell you he’s an all around great guy.